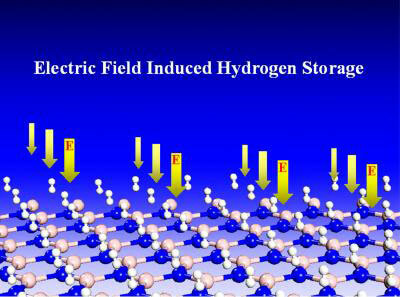 (Nanowerk News) An international team of researchers has identified a new theoretical approach that may one day make the synthesis of hydrogen fuel storage materials less complicated and improve the thermodynamics and reversibility of the system. Many researchers have their sights set on hydrogen as an alternative energy source to fossil fuels such as oil, natural gas and coal that contain carbon, pollute the environment and contribute to global warming. Known to be the most abundant element in the universe, hydrogen is considered an ideal energy carrier – not to mention that it's clean, environmentally friendly and non-toxic. However, it has been difficult to find materials that can efficiently and safely store and release it with fast kinetics under ambient temperature and pressure. This image illustrates that an applied electric field polarizes hydrogen molecules and the substrate, inducing hydrogen absorption with good thermodynamics and kinetics. The team of researchers from Virginia Commonwealth University; Peking University in Beijing; and the Chinese Academy of Science in Shanghai; have developed a process using an electric field that can significantly improve how hydrogen fuel is stored and released. "Although tremendous efforts have been devoted to experimental and theoretical research in the past years, the biggest challenge is that all the existing methods do not meet the Department of Energy targets for hydrogen storage materials. The breakthrough can only be achieved by exploring new mechanisms and new principles for materials design," said Qiang Sun, Ph.D., research associate professor with the VCU team, who led the study. "We have made such an attempt, and we have proposed a new principle for the design of hydrogen storage materials which involves materials with low-coordinated, non-metal anions that are highly polarizable in an applied electric field," he said. "Using an external electric field as another variable in our search for such a material will bring a hydrogen economy closer to reality. This is a paradigm shift in the approach to store hydrogen. Thus far, the efforts have been on how to modify the composition of the storage material. Here we show that an applied electric field can do the same thing as doped metal ions," said Puru Jena, Ph.D., distinguished professor in the VCU Department of Physics. "More importantly, it avoids many problems associated with doping metal ions such as clustering of metal atoms, poisoning of metal ions by other gases, and a complicated synthesis process. In addition, once the electric field is removed, hydrogen desorbs, making the process reversible with fast kinetics under ambient conditions," he said. The team found that an external electric field can be used to store hydrogen just as an internal field can store hydrogen due to charge polarization caused by a metal ion. "This work will help researchers create an entirely new way to store hydrogen and find materials that are most suitable. The challenge now is to find materials that are easily polarizable under an applied electric field. This will reduce the strength of the electric field needed for efficient hydrogen storage," said Jena. The research is based on a 1992 published polarization theory by Jena, the late B.K. Rao, a former professor of physics at VCU, and their student, J.Niu.